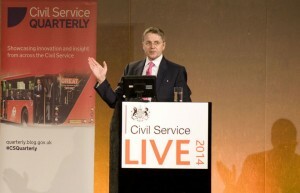 Civil Service Live is now an established part of the public sector calendar. It’s a wonderful opportunity to celebrate the Civil Service's achievements, to share experiences and ideas, and showcase and be inspired by the great work being done by civil servants around the country. Overall, it’s the biggest learning opportunity of the year, and representative of our commitment to develop the skills and careers of civil servants wherever they work. That commitment is two-way, so this is another chance for you to invest in your individual learning and development. It’s completely free, and counts towards your five-a-year learning days. There will be something for everyone looking to improve themselves, including interactive workshops, practical demonstrations, fun events, and outstanding speakers. CS Live is particularly helpful for managers at all levels, who can act as a kind of learning multiplier, taking what they’ve learned back to inspire and motivate their teams, and passing on practical new tools and different ways of doing things. As we focus on the programme of the new government, CS Live also offers the chance to hear more about its priorities from ministers themselves. When I attended CS Live last year, I was struck forcibly by the widespread enthusiasm for learning and the huge range of opportunities available. To be a truly modern Civil Service we can’t afford to stand still. We need to be more skilled, more collaborative, more diverse, open to new ways of working, and constantly getting better at the job of advising the Government and serving the public. So, reserve the date of your local Civil Service Live event in your diary, register online , book the sessions that best meet your needs, learn something new and invest in your future. You can find more information about this year’s events at the Civil Service Live website, where registration is now open. Getting your career development down to a "T"
I was looking at the venues for CS Live and noticed that there was nothing happening in Northern Ireland. I know there is probably only a small number of civil servants in the Province but it would be nice to be included in events like this. I'd drop Dods a line on the contact details on that page to be alerted for next year's event. The event in Belfast was for the Northern Ireland Civil Service, in the MoD we work for the Home Civil Service. I tried to book for Edinburgh session, it show up that it is fully booked. Do you have a reserves list if anyone drops out if so can i be added to it?